There is evidence of human activity on Colonsay going back to 7,000 B.C. 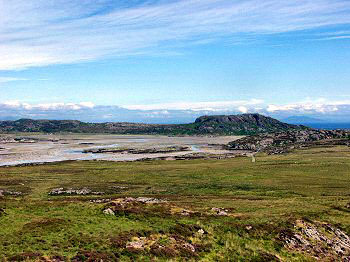 and all over the island you can find evidence of Colonsay's long history ranging from the Iron Age forts and duns which still dominate the Colonsay skyline, to the abandoned village of Riasg Buidhe, which was inhabited up to 1918. 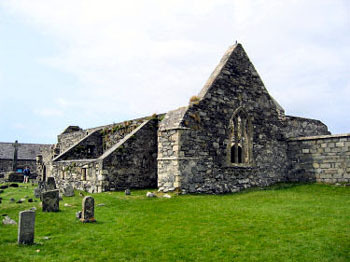 While it would be nice to lay claim to a monastic site predating Iona, the magnificent priory on Oransay, much of which much is still standing today, was actually founded by the Augustinians in the early 14th and became an important religious centre for the islands and Argyll over the next two hundred years. The ruins are well-preserved and there is a wonderful collection of carved gravestones. 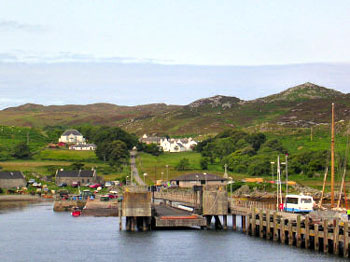 Nowadays with just over one hundred inhabitants and its nearest neighbouring community almost twenty miles distant, Colonsay constitutes one of the most remote communities in Britain. Colonsay - One Of The Hebridies - Murdoch McNeil A facsimile edition of a rare work, first published 1910and written by a gifted, Gaelic-speaking botanist whose career had included a spell at Kew Gardens. 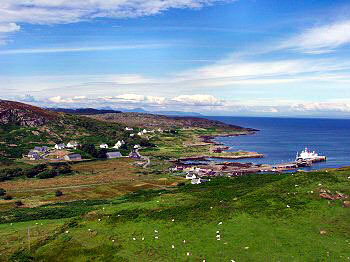 In due course he returned to his birthplace, Colonsay. As Head Gardener and Estate Manager he found time to catalogue the native species of the island and his work was to be the basis of all such studies for the next 80 years and more. In the course of his research, Murdoch McNeill collected other information and records, as is reflected in the full title of his work: "COLONSAY, One of the Hebrides. Its Plants: Their Local Names and Uses. Legends, Ruins and Pace Names. Gaelic Names of Birds, Animals and Fishes. Notes on Climate and Geology." Isle Of Colonsay - Islands main on-line presence which tells you pretty much everything you'll need to know about this remote place on the edge of the Atlantic. Armin Grewe Holidays - Excellent site by a man who clearly likes his holidays on the Scottish west coast !! Lots of superb pictures and information on Colonsay, Oronsay and other islands including Islay. Calmac Colonsay Ferry - Details of Calmac sailings from Oban to Colonsay.